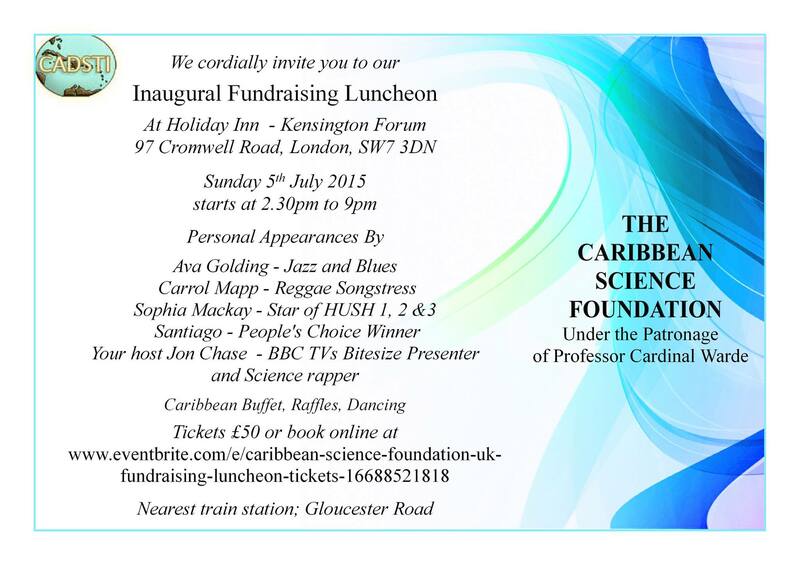 The Caribbean Diaspora for Science, Technology and Innovation UK’s (CADSTI-UK) hosted its inaugural fundraising luncheon at 3pm on Sunday 5th July 2015 at the Holiday Inn Kensington Forum (97 Cromwell Road, London, SW7 4DN) famed for its Caribbean buffet. In attendance was the President, Barbadian, Professor Cardinal Warde, of the Massachusetts Institute of Technology (MIT). The event provided attendees with an opportunity to network and to learn more about the work of CADSTI-UK and the Caribbean Science Foundation whilst enjoying great Caribbean food, drink and music by artistes such as Carrol Mapp, Sophia Mackay,Santiago, Jonathan Chase, and Ava Golding. Guests had the chance to take home several great prizes during an auction and raffle in the afternoon. All proceeds from the event went towards sending a UK student to the Student Program for Innovation in Science and Engineering (SPISE) as well as supporting the STEM Coaching Club (see ) which assists young UK Caribbean people in studying STEM subjects at the GCSE level.